This is an update of last week's Mali conflict map - for the full story, see Mali Map: Islamist Control & French Intervention. Updated map of territorial control and fighting in Mali, as of Jan. 22, 2013. Map by Evan Centanni, modified from Wikimedia map by Orionist, using images by Carport and NordNordWest (source). License: CC BY-SA. The ongoing French-led war against right-wing Islamic insurgents in northern Mali has achieved another victory. Douentza, probably the most important of the central Malian towns formerly held by the rebels, has now been secured by government and French forces. The allied troops reportedly found that the rebels had already left ahead of them, presumably fleeing the French airstrikes that targeted the town over the last week. Douentza's status had been a matter of uncertainty for some time, starting with apparently false claims of its capture by the Malian army on the eve of the French intervention. 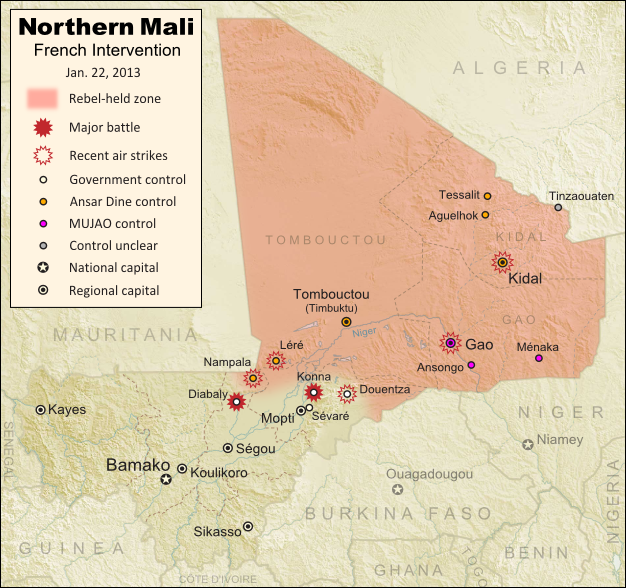 It had been held by the Movement for Unity and Jihad in West Africa (MUJAO), the more extreme of the two main rebel groups controlling territory in northern Mali (and the more closely connected to Al Qaeda). The capture of Diabaly town has also been fully confirmed now, after a few days of confusion. It had been reported that there was fighting on the ground between French and rebel forces, but residents of the town say it was mainly airstrikes that drove the militants out. Meanwhile, forces from both France neighboring African countries have continued to arrive in Mali to fight the rebels. French troops in the country now number over 2,000, while African troops from Nigeria, Togo, Benin, Niger, and Chad currently total about 1,000. Chadian and Nigerien troops are also amassing in Niger near the Malian border, from where they may open up a new front by crossing the border to take Gao, the region's largest city and currently the headquarters of MUJAO.